Of course, the answer to the question is neither but in the IFA’s Workshop in Hong Kong (November 2013) and Aviation Safety Culture Summit in Dubai (February 2014), I asked the participants this question, ‘On a scale of 1 to 5, do you think SMS (Safety Management System) is ‘Unnecessary Bureaucratic Burden’ or do you think it is ‘Panacea’?” The number of respondents to my question was quite low and most probably the majority of them were not licensed engineers but the responses indicated that there are some cynics as well as some over-optimistic professionals in the industry about SMS. I believe SMS has some limitations in terms of what it can achieve to further reduce the accident rate, which is already at a record low. I would be very interested in your views, since I believe the success of such initiatives would heavily rely on the perception of and/or buy-in from the professionals working at the sharp end. So please do consider answering my Poll Question. Nevertheless, in this article, I aim to highlight some of the weaknesses and pitfalls of the SMS concept by focusing on some of the human factors issues. Continuing Airworthiness Management Organisations as well as Approved Maintenance Organisations holding EASA approvals will soon be expected to implement a management system due to the recently drafted but not yet published European regulations. (Ref: NPA 2013-01 & 2013-0-19) I will discuss some of the changes proposed by these ‘Noticed of Proposed Amendments’ (NPA) how they may affect a licensed engineer’s daily life. I must also add that most of my views and suggestions are mainly based on commercial air transport rather than general aviation. Additionally, considering the diversity (base, line, component, specialised services such as NDT etc.) of the maintenance services offered by a variety of organisations in the industry, there is no doubt these new proposed changes will require careful implementation not only to achieve the safety performance improvements we aim for but also to avoid creating unnecessary burden by the regulatory authorities during the oversight inspections / audits. Introducing a new legislation to achieve better safety performance may or may not be always effective; however in this case, introducing ICAO Annex 19 standards in European regulations was inevitable. As an ex-certifying engineer, who hasn’t been directly involved in the industry for at least the last 7 years, I am not entirely sure what SMS means to a licensed aircraft engineer working at the sharp end today. My ex-colleagues and friends work on modern aircraft which are ever more sophisticated and integrated, and the industry is certainly subject to many more regulatory requirements and compliance issues than when I left. Since its establishment in 2003, European Aviation Safety Agency (EASA) has been extremely productive in terms of its rulemaking activities within the last decade. Some of the trade and professional organisations regularly raise their voices about the financial impact of some of the rules made. During his keynote address at the last EASA Annual Conference in October 2013, the Executive Director of EASA, Patrick Ky, has clearly stated that in many cases, rulemaking activities are initiated by the member states and/or accident investigation bodies and he requested the participants to be more cautious about their expectations from the Agency. His key message was, in future, less rules but better rules should be made. This is a significant change in direction and one may argue that it is clearly reflected by the latest rulemaking programme (2014-2017). Regulating SMS will introduce some organisational changes as well as some technical requirements. For decades, in order to manage safety, we made strict rules and then expected organisations to comply with these rules by implementing ‘Quality Management Systems’, which aimed to audit the procedures and processes to ensure compliance and the identified issues are addressed to make continual improvements. In other words, we expected Quality Management Systems to ensure compliance with safety regulations. Now the new proposed European rules mention only a ‘Management System’ rather than quality or safety management system and the traditional quality management function is now referred as ‘Compliance Monitoring’. 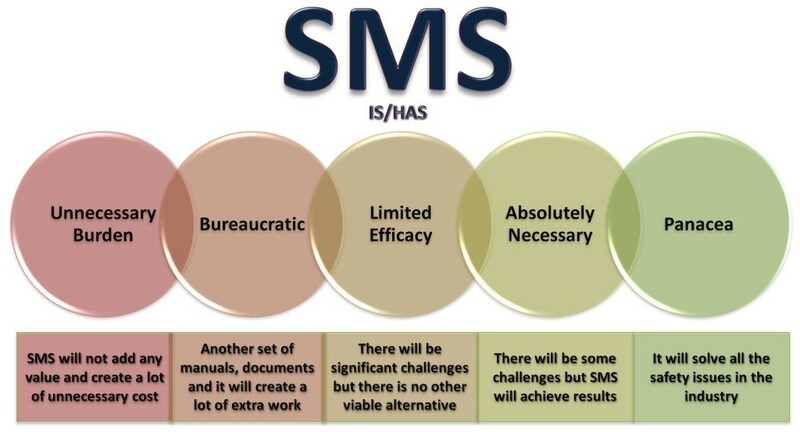 In the past, I used to argue that SMS was implemented by only some of the organisations as best practice. It meant being more proactive and going beyond compliance but we now have reached the era of SMS, which will be mandated by the regulations. According to the published NPA’s, the new management system will still have the ‘Compliance Monitoring’ function in order to continue ensuring compliance with all the other existing regulations. Additionally the organisations will implement the new SMS components such as ‘Safety Risk Management’, ‘Emergency Response Planning’ and ‘Fatigue Risk Management’ etc. I personally think that mandating SMS by introducing new legislation creates a rather unique challenge. I believe some organisations have – what I call – a ‘Compliance Culture’ where demonstrating compliance become more important than achieving the intent of the regulations or in this case SMS. You might just think the two ‘compliance’ and ‘achieving safety’ should mean the same thing but I would argue that sometimes by getting obsessed with compliance and auditing, we can get distracted and fail to make the necessary safety improvements in practical terms. For example, some organisations, I had discussions with in the past, asked me to share my past experience i.e. risk registers, risk assessments etc. Their main aim was purely to produce some evidence that they can show to the regulator rather than understanding the risk management process and conducting meaningful risk assessments, which reflect the real situations in their operation. I think the regulators and safety practitioners should focus on the human performance issues rather than pure focusing on compliance. I am absolutely convinced that if we provide the necessary tools and investment to people carrying out safety critical tasks, they will achieve the necessary results. Also the concept of risk based auditing should be a key component of safety management. Today, particularly large maintenance organisations hold multiple approvals from various countries and provide services to many airlines. One of the challenges they face is the high number of duplicated audits they are continually receiving. This conundrum has financial impact for all parties and in some cases do not add much value in terms safety and airworthiness. This issue was raised by the industry representatives at the Paris Conference in June 2013 and the need for change was recognised by the regulatory authorities. Nevertheless it will require a lot of time and certainly political will to make some real changes in order to achieve bilateral recognition of certificates between many states around the world. One of the fundamental characteristics of SMS is the data driven approach. In the past, I had used the analogy that data is like food for SMS and without data, it will be malnourished, therefore we need to collect a lot of data to be able to identify high risks and prioritise our efforts to focus on those areas. For flight operations, Flight Data Monitoring (FDM) systems enable the collection of operational data more easily, particularly to identify human performance issues. In maintenance environment, the safety data collection heavily relies on the engineers’/technicians’ participation. When the proposed changes are implemented, certifying engineers/technicians will be expected to report not only occurrences and incidents/accidents but also near-misses and potential hazards. Reporting culture is a hot topic, which is regularly discussed by safety practitioners in the industry. Although it is not an easy task to improve reporting in an organisation, there are a number of initiatives, which can be considered. Some of them can be listed as the ease of reporting, improved feedback given to the reportees to create a trust in the system and perhaps, most importantly a published ‘just culture policy’. Although the proposed changes introduce the confidential reporting and the ‘Just Culture’ policy in the ‘non-binding’ ‘Acceptable Means of Compliance (AMC)’ rather than within the ‘Implementing Rules’, it will be very difficult for organisations to justify not implementing these requirements. Of course, even if they are included in the mandatory text, the main issue can be the careful and appropriate application of just culture policy rather than paying a ‘lip service’. While concepts such as James Reason’s ‘Culpability Tree’ model, ‘Substitution Test’ etc. are used by some organisations, I have also heard comments from safety practitioners in the industry that such tools can be used to justify the ‘already made decisions’ to punish individuals raising their safety concerns. During a recent discussion with a professional who continually raised his concerns before eventually going public and losing his job, he strongly highlighted the importance of the dialogue between the workforce and the management. Of course, such dialogue requires participation of both parties. Establishing ‘Safety Action Groups’ (SAG) in particularly large and complex organisations is included in the proposed Acceptable Means of Compliance (AMC) (NPA 2013-01). Perhaps this might be an opportunity to create the crucially important dialogue between the workforce and the management. Of course, such groups and the meetings may sometimes frustrate those engineers, who raise their voices but are continually ignored by strong minded managers, who may be too focused and driven by the commercial performance of the organisation. Nevertheless engineers/technicians should get involved in safety action groups whenever possible and also strive to continually raise meaningful reports that include factual information and provide the opportunity for management to identify potential hazards and mitigate risks. Even though the organisation achieves a healthy reporting culture, another potential pitfall is that, investigating high number of reports and implementing risk mitigation measures may require considerable amount of resource, which will create a challenge for the safety practitioners and require financial commitment from the top management. This may have an adverse impact on the reporting culture in the long run. Some argue that SMS is all about the safety risk management process and ICAO Safety Management Manual defines the process with three steps ‘hazard identification’, ‘risk assessment’ and risk mitigation’. One of the presentations created by FAA on this topic, clearly differentiates the hazards from risks in terms of ‘time’ dimension. The simple premise is that hazards exist in real time but the risks are about the future meaning the probability of the hazards causing the worst outcome. This means when we deal with risk, we deal with uncertainty and we need a crystal ball to be able to predict the probability of the worst outcome happening. The other challenge is that the concept of ‘RISK’ is inherently subjective and quantifying it is an extremely difficult task because of the human involvement. Whether it is the design, production, operation or maintenance, we cannot take the human out of the systems and a safe outcome in operational environment would always heavily rely on the decisions made by humans. Managing risks in any system or process that human interface exists would be reliant on those individuals’ perception and attitude towards risk. From organisational and management perspective, trying to control employees’ risk attitude is an impossible task. Because of the subjectivity created by our perception, it will always be impossible to draw clear lines how the employees need to make decisions. From individual’s perspective, when individuals are put in a position to make risk decisions on behalf of the organisation, they are also inevitably exposed. I hope you would agree with me that, sometimes making a decision about whether an aircraft is airworthy or not, is not clear cut and requires engineering judgement. So, an engineer/technician may have to take a conscious but risky decision, which may be perfectly compliant with rules and regulations and this may end up with an accident or incident. When you consider the consequences of a ‘genuine human error’ such as Alan Irwin’s unfortunate experience (which was covered in TECHLOG Spring 2013), the individuals need to consider their personal exposure before making risk decisions on behalf of the organisations they work for. I believe there are some prominent factors driving professionals to take more risks in today’s airline industry, which was recently described as ‘brutally competitive’ by an airline executive. One may argue that this extreme competition is the result of traveling public’s increased expectation from the industry, which also results in ‘passenger rights legislation’ introduced in many countries around the world. External factors such as increased competition and ‘passenger rights legislation’ put airlines under tremendous pressure. Many airlines around the world aim to achieve better on-time departure performance by giving financial incentives to their employees. Some of these airlines use methodologies such as ‘the balanced score card’ for business performance monitoring and safety performance would be part of the overall process. In many cases, the ultimate financial incentives such as bonuses offered to employees as well as executives are based on only the commercial performance such as on-time departure. Although the airline industry doesn’t have a prominent ‘Bonus Culture’ as significant as in the financial industry, I personally feel that professionals are regularly subject to competing or in some cases, conflicting goals but only commercial performance such as on-time departure is used for the financial incentives. It is not always easy for engineers/technicians to stand up to the commercial pressure from the management. Although the organisations will be expected to monitor their safety performance, I personally don’t think that regulatory authorities will be willing and able to intervene to prevent organisations from offering incentives, which may sometimes encourage risk taking behaviour. This situation put more responsibility on engineers/technicians to maintain their integrity and professionalism. Fatigue Risk Management is another area that the NPA’s will introduce some new text in the form of ‘Acceptable Means of Compliance’ (AMC) and ‘Guidance Material’ (GM) rather than mandatory requirements. This is mainly to address the UK AAIB’s recommendation following an incident in 2010. The proposed AMC and GM changes will give flexibility to organisations to make their own assessment if they need to implement a comprehensive FRMS based on the complexity of their business, number of employees and the shift patterns they work. The organisational measures form the necessary foundation but the key to manage fatigue risk in maintenance environment also lies with the individuals. The majority of the FRMS initiatives at a global level (driven by ICAO, IATA, IFALPA etc.) and the rule making activities (initiated by FAA, TCCA, EASA etc.) all aim at addressing flight crew fatigue. There are some studies focusing on maintenance personnel fatigue carried out by some regulatory authorities such as FAA, TCCA and UK CAA. They also published some guidance material helping organisations as well as individuals. When you consider the previously discussed challenges about airline industry, employees may sometimes be pressurised to work extensive hours to achieve on-time performance. Additionally it is in their interest to work overtime when there is an opportunity to gain considerable financial gain. Under the current economic climate, it may sometimes be difficult to resist to temptation and individuals may continually work long hours over a period of time. This may cause ‘cumulative fatigue’, which is sometimes difficult to recognise and one of the highest risks in this area. In case of an accident or incident due to maintenance personnel fatigue, the individuals’ liability will be scrutinised. Considering the circumstances, which were already discussed above, the question whether the fatigued professionals should be fully accountable or not, will always be controversial. The only thing we should not tolerate is those individuals, who sometimes do not rest enough due to their irresponsible life style decisions. Even though the organisation provides the opportunity to rest, if the employee does not rest enough and still turn up at work and continue carrying out safety critical tasks, this cannot be acceptable. I believe the changes introduced by the recent NPA’s will bring some significant changes in the way the safety is managed in CAMO’s and AMO’s; however the whole industry should not forget that until we address the real challenges affecting human performance, we will not be able to achieve both commercial and safety improvements we aim for. As I am currently conducting research on risk perception and risk attitude of pilots and engineers, I would be very interested in hearing about your experiences. Please note, all correspondence will be kept confidential. Disclaimer: The views and opinions expressed in this article are solely my own and they do not necessarily represent the views of any of the organisations I am associated with.